Five years after a massive earthquake severely damaged the health system, Haiti’s Ministry of Public Health and Population is taking important steps toward building a strong nursing workforce. At a recent ceremony, the Health Minister and acting Prime Minister Dr. Florence Duperval Guillaume and other government officials met with the headmasters and owners of nearly 40 nursing schools to roll out Haiti’s revised nursing education standards and accreditation process. Ministry of Health staff, headmasters, school participants, and HFG staff at the logo announcement ceremony. After the earthquake, the number of private nursing training institutions jumped to more than 400. But little was known about the quality of education provided or the technical skills of the graduates. To address this problem, USAID’s Health Finance and Governance (HFG) Project worked closely with the Ministry to develop new standards that could be used to evaluate the nursing schools. Known as reconnaissance, the goal of this new accreditation process is to improve the quality of nursing education, protect the interests of the public, ensure the programs teach students entry-to-practice competencies, and guarantee that patient safety is a priority. At the ceremony, which took place January 8th in Port-au-Prince, Dr. Guillaume and Dr Georges Dubuche, Director General of the Ministry of Health, presented the Ministry’s new accreditation logo, which schools can earn and display once they meet at these revised standards. During the first phase of reconnaissance, more than 40 nursing schools completed an auto-evaluation form. After reviewing these evaluations, experienced Haitian nurses and nurse educators trained in the new process then conducted intensive site visits of each of the schools to validate the auto-evaluation forms. A jury organized by the Ministry’s Department of Training reviewed these forms. The jury included one person from several MOH Directorates: Direction de la Formation et du Perfectionnement en soins de santé (DFPSS) Direction des Soins Infirmiers (DSI), Unite des Affaires Juridiques (UAJ), Centre d`Information et de Formation en Administration de la Santé (CIFAS) and two experienced external nurses. The headmaster should be a certified-licensed nurse. The acting Prime Minister of Haiti and Hon. 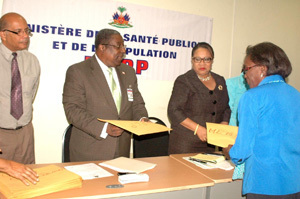 Minister of Health Dr. Florence Duperval Guillaume, assisted by Dr Georges Dubuche, Director General of the MOH, presented the schools with their reconnaissance evaluations. As soon as schools respond to their evaluations and make the required changes, they will earn the official Ministry of Health logo. They have three months to complete this step of the process. In addition, the Ministry announced that the nursing curriculum will now take four years, not three, and will be the equivalent of a university degree. To measure the quality of the education students receive, students are required to pass a state exam before being allowed to practice. Annual tuition for nursing schools can cost as much as $4,000-$5,000. Given this high price tag, and the burden it can put on families, the Ministry of Health wants to ensure that all nursing education meets Haiti’s quality standards. The new logo and the public recognition will help students, their families, and potential employers identify high-quality private nursing schools. To spread the word about the logo, the HFG Project will support production of two radio spots – one for students, one for parents – to ensure they verify that an institution is approved by the MOH. They will be encouraged to look for the new logo, which will be displayed on the MOH’s website and Facebook page. All schools accredited will also be listed on the website. Building on this success, phase two of the reconnaissance roll-out is underway with an additional 52 schools starting the process. Haitian officials who attended the ceremony included Dr. Florence D. Guillaume, MOH Minister and Haiti Prime Minister, Dr. Georges Dubuche, General Director MOH, Mrs. Yolene Elysee, DFPSS Training section chief of service, Dr. Eunice M. Derivois, DFPSS Director, Mr. Guy Leveille, MOH chief of staff, and Mrs. Irma Bois, Direction des soins Infirmier, DSI. The revised standards were developed by the Ministry’s Department of Training in partnership with the HFG project and consultants from the Canadian Association of Schools of Nursing.